Review of Adblade: How Well Does it Work? Blog > Resources > Review of Adblade: How Well Does it Work? Adblade is an interesting entity in the world of CPC marketing. They bill themselves as an extremely high quality, ultra-exclusive ad network with a limited number of very high profile clients, including massive sites like Yahoo and Fox News. As such, they’re very exclusive and very hard to get into. 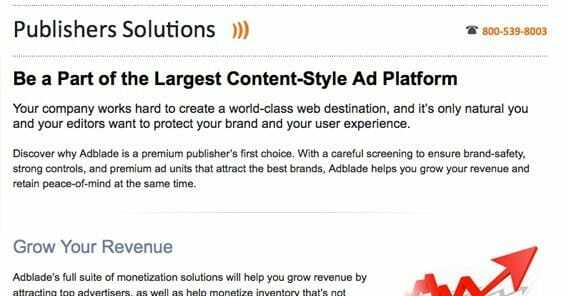 As a publisher, that is, the site that displays ads from Adblade in order to get paid, you need to meet their strict requirements. Specifically, you need at minimum half a million monthly pageviews. That’s 500,000. That’s a lot of traffic! It’s well beyond the reach of most small affiliate sites, which also puts it beyond the reach of the vast majority of small-time black hat spammers. On the surface, Adblade is very much like other services, like Outbrain. They specialize in native ads, those ads that look like small “related posts” thumbnails along side articles on large news sites and blogs. 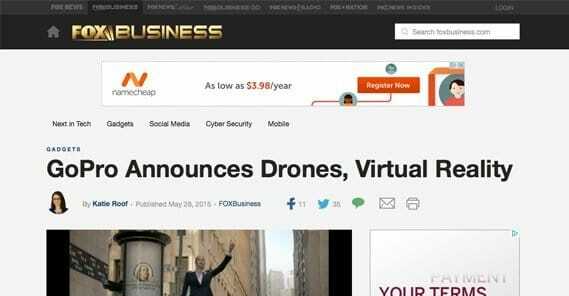 The only thing to differentiate them from native ads, really, is the small gray “advertisement” label in the corner. If you’re not paying attention – and who is? – they slip right through. 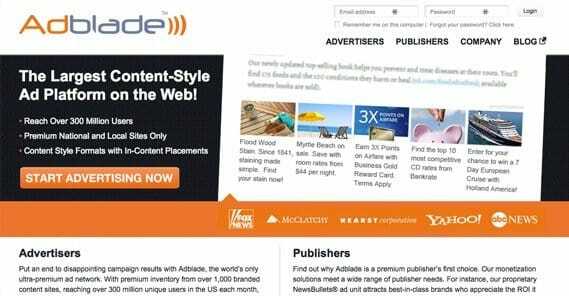 Adblade was founded in 2008, making it relatively young for a display ad network. They have around 1,700 followers on Facebook and an A+ ranking with the Better Business Bureau. So what do they ask of publishers? Unfortunately, that’s pretty much unknown unless you fit their requirements. We know the 500,000 monthly views figure – that’s around 17,000 per day on average, for those at home – but that’s it. Their contract, their terms, and any content restrictions are unknown. As for advertisers, they accept all verticals but they have restrictions on the quality of the content. They don’t want to send people to thin sites, scam sites or affiliate sites, of course. They prefer legitimate blogs and businesses, and for good reason. Far too many ad networks fall victim to a profusion of low quality sites on both ends of the spectrum. Adblade combats this by being hyper-exclusive. They also restrict long-tail sites, specifically because using a long-tail domain name is a modern day sign of spam. One thing they don’t regulate, however, is the nature of the titles they promote. Very often, you’ll find that ads promoted by Adblade tend to have somewhat clickbait-style headlines. They’re nothing so bad as what you see on Upworthy or Buzzfeed naturally, at least. Think more along the lines of the ads on Cracked or the Weather Channel website. This does occasionally have the side effect of looking spammy, but then, who cares? The sites that are big enough to use Adblade are big enough to shrug off a minor impression of spam. Adblade has a range of ad unit sizes, various rectangles designed to fit with other website designs. Publishers should pick ad units that best fit with their native style, such as the natural 300×600 footer ads or the 120×90 mobile newsbullet ads. One benefit of Adblade is their allowance of Google AdSense. This helps both publishers and advertisers keep track of traffic through their native analytics. It’s always good to have firsthand verification of secondhand statistics. So how does it all perform? As an advertiser, it’s actually a very good network, so long as you find the right niche. They accept any vertical, but some verticals have much better demographics through the network than others. For example, with Fox News as a primary publisher, you can’t really find much success with pro-liberal ads. Of course, part of that is all about presentation. Perhaps the biggest roadblock beyond the network’s exclusivity is the price. As an advertiser, you’re paying to get people to your site. Some ad networks can give you clicks ranging from one cent to 15 or 20 cents per click. Adblade tends to hover around 50 cents to a dollar per click for most verticals, with some of the higher competition verticals rising even higher than that. I do have one major gripe with Adblade, and that’s with their support. For example, it’s very easy to forget to add the Adblade tracking pixel to the ads you run, so the ads won’t be optimized. You’ll end up running on less than ideal positioning, losing out on potential earnings. Contacting their support to help with this will get you through the issue, but you’re not about to get a refund or even any real nice treatment. They’re used to dealing with huge companies, so their ability to please individual small businesses is limited. Because of the expense associated with buying traffic from Adblade, you really need to be in the right business to make a profit. You can’t run CPM ads on your site and expect to do anything other than lose money. Instead, you need to have high value offers or products of your own to sell. Volume won’t do it unless you have a very high conversion rate. One question you have to ask yourself before you decide to work with Adblade, however, is how much you care about the reputation of the business and their dealings outside of the mechanics of their network. 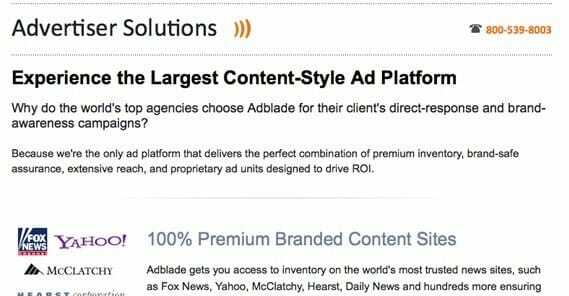 In this case, Adblade has been the source of a lot of negative press relating to how they compete with their direct competitors, other high-profile and high-quality ad networks. Specifically, in this instance, I’m thinking of their failed court case against Broadspring, which seemed to expose them as liars in the pursuit of more traffic for themselves. Now, if you don’t care what the business does so long as their traffic is legit, then you will have no problem with Adblade. If you’re a little more concerned with the morality of supporting a company that lies about their competitors in order to get ahead, you might want to reconsider. Overall, Adblade can be a very effective network for advertisers. Likewise, it can be extremely lucrative for publishers, so long as those publishers have the traffic to quality for the network in the first place. Questionable morality aside, the site works, and it works well. How Does Traffic Trading Work and is It Worth It? What Are Pop-Under Ads and How Do They Work? Not clear how often they pay Publishers. Does anyone have any experience with them as a Publisher and get paid on time? I tried using Adblade and I didn’t get paid. That site is a scam. Beware. That makes me so confused when i heard lots of positive and negative reviews about this network. Definitely nervous to try them. Adblade do not pay nor reply to email. I think is a scam.